St Albans School is a long established independent school in Hertfordshire, UK. Founded in the year 948, the school has the distinction of being one of the oldest in England, and indeed the world. Today, the school boasts a modern campus and provides a holistic education focused on academic excellence and strong pastoral care. When Titus Learning first met with St Albans, the school had been using Moodle for some time, but were looking for a better alternative. At that stage they were considering the best way forward to improve the platform and increase engagement and usage from staff and students. Migration of Moodle from an existing supplier to new infrastructure and upgrade to the latest Moodle version. Integration between Moodle and Double First’s MIS, Engage, the school’s management information system, as well as other third party tools currently in use. Creation of a new Moodle theme to overhaul the look and feel of the site and improve the user experience. Provision of proactive support alongside ongoing hosting and maintenance. As St Albans School was already using Moodle, rather than starting from scratch, we were able to migrate those elements which would be carried across to the new platform. Previously the Moodle platform had been hosted on an on-site server at the school’s premises, however in order to improve both the performance and ease of maintenance of the system, we proposed moving the platform to a cloud environment on Amazon Web Services. Giving remote access to Titus Learning to manage security patches, version updates and monitoring of the Moodle system. Improved performance and provision of extra capacity during peak demand. Enabling better integration between Moodle and third party services (see below). Allowing for scalability to meet increased requirements in future without the need for further migration. In terms of integration, the school’s number one priority was ensuring that the new Moodle platform worked seamlessly with the new management information system, Engage. Active and pre-admission student data. Teaching and non-teaching staff data. This allows the imported MIS data in each of these areas to be viewed in Moodle without the need for separate access to the MIS system. The school are therefore able to make this data available as appropriate to staff, students and parents alike. In addition to integrating the new MIS system, we also ensured that other tools, including the school’s homework management system and content production tools were tightly integrated with the new Moodle platform. Single sign-on into Moodle and Office 365 services such as Email, Calendar, OneDrive and OneNote, and user sync between the two platforms. Full calendar integration (synchronised in both directions). OneNote integration offering students the ability to submit work and teachers to provide feedback via OneNote. OneDrive integration allowing users to upload files into Moodle courses that are stored in their OneDrive. Embedding of Office 365 documents within Moodle courses via the oEmbed filter. To ensure that the new functionality would be used on a day-to-day basis by the whole school community, a key part of the project was to improve the user experience (UX). Following a detailed consultation, our design team created a new bespoke Moodle theme to address the school’s main requirements. We used an iterative workflow, showing regular wireframes to the team at St Albans School during the design process. This allowed us to amend and improve the designs “on-the-go”, an approach which avoided any unnecessary rework. The custom theme which we implemented improved on the previous Moodle in several areas: saving time by streamlining common tasks such as adding content, a “my apps” menu to give quick access to commonly used features, and a personal dashboard showing vital user info. A key part of our service is the creation of a Moodle implementation plan which runs from the development of the platform, through to the launch and beyond. 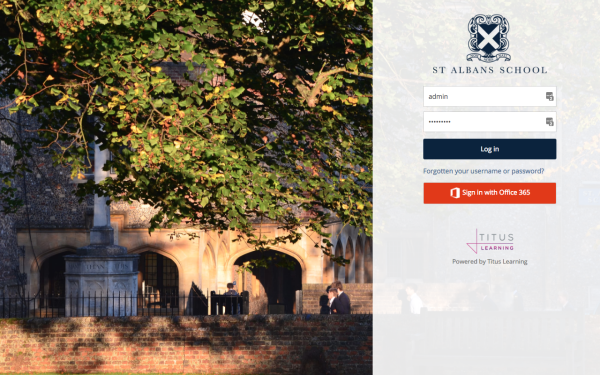 We were involved in assisting St Albans School with the promotion of the new VLE to stakeholders, training staff and students, and notifying users of ongoing developments. During the development phase, as well as post launch, our dedicated support team were available to address any minor issues which may crop up. Looking to the future, our team continues to liaise with the schools’ VLE team, as well as monitoring the usage and performance of the Moodle platform remotely to ensure everything is running smoothly, as well as providing regular security and version updates, in line with the new releases provided by Moodle HQ.